Fried rice with your choice of meat, eggs, tomatoes, onions, peas, and carrots. Fried rice with your choice of meat, eggs, onions, bell peppers, crushed Thai peppers, and sweet basil leaves. 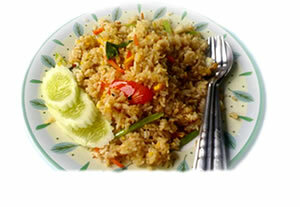 Fried rice with your choice of meat, eggs, pineapple, raisins, and cashew nuts. Fried rice with your choice of meat, eggs, sweet Asian sausage, tomatoes, onions, peas, corn, and carrots. A Thai favorite fried rice with crab meat, eggs, and cilantro.